1. Preheat the oven to 350 degrees. Use 1 tablespoon of the butter to grease an 8-½ × 11-½-inch oval baking dish. 2. In a large (12-inch) pot or Dutch oven, such as Le Creuset, heat the remaining 2 tablespoons of butter and 1 tablespoon olive oil over medium heat. Add the onions and garlic and cook, stirring occasionally, for 6 to 8 minutes, until tender. Stir in the squash, nutmeg, 2 teaspoons salt, and ¾ teaspoon pepper, cover, and cook for 10 minutes, stirring occasionally. 3. Spoon the squash mixture into the prepared baking dish and smooth the top, making sure all of the squash slices are laid flat. Pour the cream over the mixture. 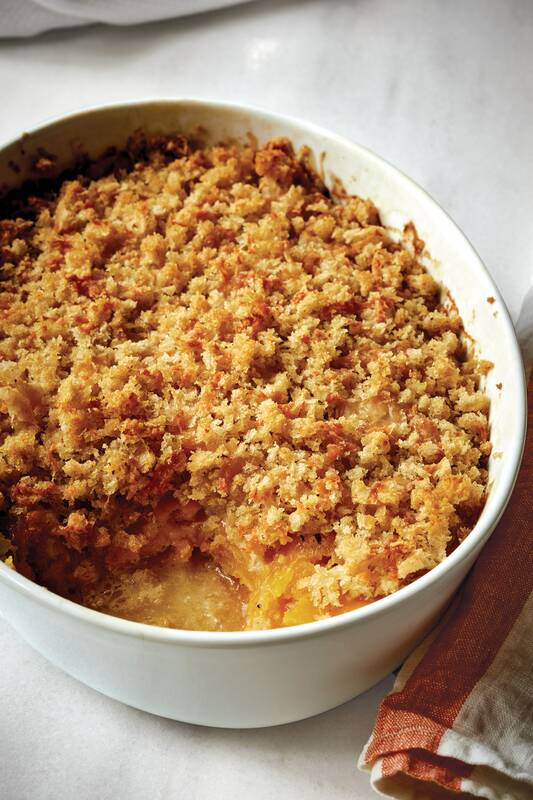 In a medium bowl, combine the bread crumbs and 2 tablespoons olive oil and mix in the Gruyère. Sprinkle evenly over the squash. Bake for 35 to 40 minutes, until the top is browned and the squash is very tender when tested in the center with a small knife. Sprinkle with salt and serve hot. Saturdays at the Farm – It’s not just for kids!